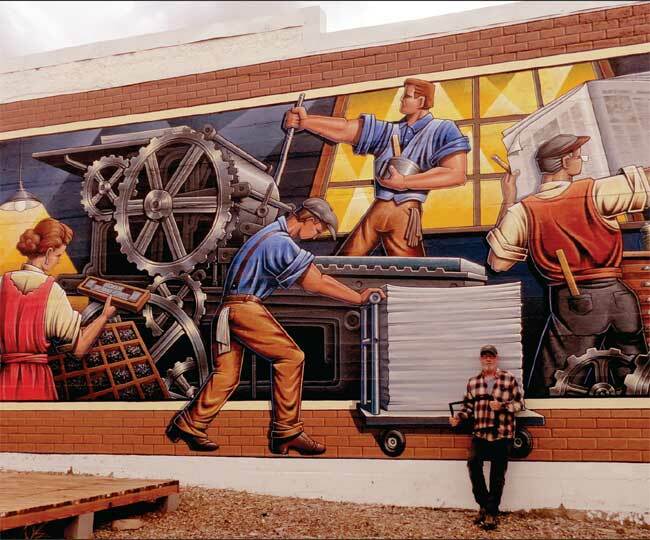 An immense mural by Mancos artist Brad Goodell on the side of the Mancos Times-Tribune building illustrates the energy and effort in a newsroom 100 years ago. The building, now restored, is the home of the Mancos Common Press, a printing arts shop. Photo by Sonja Horoshko. A project to preserve and restore the historic Mancos Times-Tribune building on Grand Avenue in Mancos is on the threshold of repurposing the technology that printed the news in Southwest Colorado for more than 100 years. A rare 1910 American Cranston printing press, a Chandler & Price platen press, typesetting tables and workbenches, and cabinets of moveable lead type stand quietly within the ambiance and aroma of a restored classic newsroom. The archaic equipment attracts artists and writers returning to the technology precisely because it is a preciously slow, hands-on process – an organic, high-quality method of relief-based printmaking. Lead-type printing has changed little since 1439, when Johannes Gutenberg invented the first precise, rapid metal moveable type suitable for the common screw-presses in use throughout Europe at the time. Although the press and moveable type have been continuously modernized, the concept remains the same. A raised bed of lead type and incised wood blocks is placed opposite another surface spread with an even layer of ink, while a sheet of paper is positioned between them. All of it is pressed together once, leaving the ink imprint of the text and images on the paper. The resulting print can be reproduced repeatedly in a short period of time. Gutenberg’s invention opened the door for the democratization of information, which until then had been contained in handwritten, illuminated manuscripts produced for the wealthy and the church. Until the early 2000s, when digital information began replacing print resources, news ruled the domain of letter presses. Today, the techniques are earmarked for artists and writers. The Mancos Times¸ founded in 1893, one of Colorado’s oldest newspapers, enlarged to become the Mancos Times- Tribune under new ownership and moved to the Grand Avenue building in 1910. It remained in the building on Grand Avenue until the 1970s, when the newspaper moved production to Durango. It has since ceased publication. Over the years, most such print equipment has been disassembled, the presses silenced and sold for scrap. The skilled typesetters and pressmen have retired, leaving a void in knowledge of the newsprinter’s craft. The survival of the Mancos Times building is a rare success story. Frank Matero, professor of architecture and chair of the graduate program in historic preservation at the University of Pennsylvania, spends his summers in Mancos working with graduate students doing restoration projects at Mesa Verde National Park. The building on Grand Avenue always interested him. In 2013 he asked Betsy Harrison, then chair of the Mancos Chamber of Commerce, if he could look inside it. The windows in the back of the building were boarded up with plywood and all sorts of things had been stacked in the dim, dusty room. Although he was focused on the architecture, Matero noticed the unmistakable form of a printing press, the old Cranston, one of only a handful that exist in the country today. Matero returned that year with a proposal for the Chamber of Commerce. In addition to basic historical research and an inventory of the property by his students, he proffered a partnership with the university’s PennDesign The Common Press letterpress printing program established in 2006. If the town accepted his offer and formed a steering committee, the collaborating groups could revive the building as a printmaking arts and educational center. Representatives of several local groups organized the Mancos Common Press and a steering committee. Richard Ballantine, publisher of The Mancos Times-Tribune and Durango Herald, joined the committee and eventually donated the building to the project. The result was a restoration of the building as a new facility for students of graphic arts, a unique opportunity for the town of Mancos, the Pennsylvania Center for Architectural Conservation and PennDesign The Common Press. Matero’s students prepared a Historic Structures Assessment and conservation analysis of the interior and exterior. They uncovered a complete set of newspapers printed in the building from 1910-2010, a valuable historical record of the town and county. Parts of the collection are in the Denver Public Library being digitized, Harrison said. At some point the group hopes to have them all accessible to the general public. Although their surveys uncovered treasures in equipment and documents, the projected restoration costs were growing. In 2014 the steering committee became a board of directors, giving the group access to Colorado State Historical Society grants. “Finally, the project was funded in 2017, which has made it possible to finish the restoration of the property,” Harrison said. Ballantine commissioned an exterior mural on the west side of the building showing a newsroom with an American Cranston press like the one inside. It was painted by Mancos muralist Brad Goodell. Today, a wooden stage in front of it provides a backdrop for the Mancos Farmers Market. The whole project has been documented by graduate student Samuel Loos in his thesis. The back wall, which had been significantly altered, was recreated from a 1911 photograph. His restoration files now include the photographs and numbering record of each ornamental metal tile originally used on the building while they were temporarily removed during installation of the modern heating and ventilation system. Missing and damaged areas were filled in with plastic replica pieces made at PennDesign’s Fabrication Lab using modern vacu-form technology. While volunteers worked on the Cranston press, getting it ready for another century of use, the existing exterior and interior paints were analyzed and replicated in the printing shop as it was 100 years ago, creating a fresh workshop with sky-blue walls, a yellow ceiling and frieze, and gray woodwork. During a recent visit to the building, local poet Rene Podunovich, met with Goodell for an introduction to the printing process. Goodell, who is a commercial illustrator as well as a muralist, moved with his family to Mancos after he taught studio design classes at the University of New Mexico. “I’m really more the technician than an arts coordinator,” he admitted as he began organizing a woodblock image beside some type in a metal chase he recently built to match the one in the press. 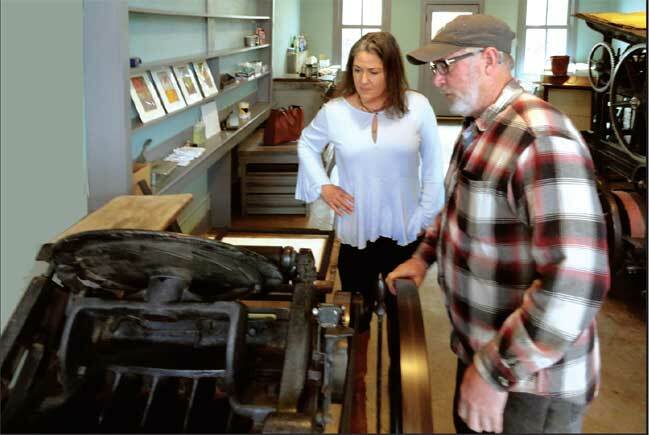 Brad Goodell demonstrates the use of the Chandler & Price platen press to local poet Renee Podunovich.The press, and two smaller greeting-card-size presses were donated to the Mancos Common Press project by Larry Hauser, a former Cortez Journal pressman. Partially in view on the right is the 1911 American Chandler Press. Photo by Sonja Horoshko. Goodell and the Common Press board are working to develop classes that thoroughly educate users about the care and value of the studio, the presses and the suites of print runs that come from the effort. “Can you imagine breaking down a behemoth metal press like this old Cranston and moving it across the county on a train in 1911,” Goodell asked, “then putting it into wagons and pulling it by draft horse to get it to Mancos?” He climbed up on the operator’s platform on the side of the press nearly four feet above Podunovich as he explained the basic differences between the smaller, working Chandler & Price platen press and the giant Cranston. The latter machine can actually be dangerous when it’s running. “We are not offering any workshops on it until we are absolutely sure all the parts are working properly, and we are convinced that the operator has enough experience to respect the process,” he said. Harrison is hesitant to commit to any schedule of classes at this time, pointing to the same considerations Goodell has, but said the sustainability of the presses and equipment, the space and the quality care of the building are issues the board will untangle soon. She said word of the studio is spreading among artists and poets.